Step 1. Buy the shirt. Buy our unique, funny, stylish and extremely comfortable 100% certified organic ringspun cotton t-shirt. A dollar from each t-shirt you buy goes directly to conservation efforts. By supporting those who fight to protect the land and water we cherish, we ensure that there will always be a place to hike and camp for future generations. Not only does a dollar from every t-shirt go toward conservation efforts, but our shirts are also part of the Buy a Tee, Plant a Tree program. For every t-shirt you buy, a tree is planted through Nature Conservancy’s Plant a Billion Trees initiative. Step 2. Wear the shirt. Sit back and look cool in your shirt knowing you are saving the world like a freakin’ super hero. This t-shirt is fashionable and eco-friendly at the same time, and you know that your purchase is helping the greater good. Passion for nature runs deep in any outdoor enthusiast. 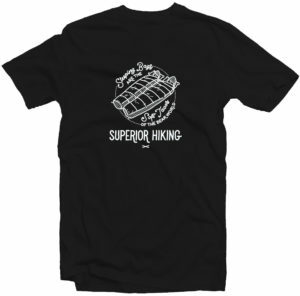 Superior Hiking is offering you a way to show your passion for the environment while doing something to help, through the simple act of buying a t-shirt that you will love.